The people at the Reeves International Booth were so very nice. I’m not versed in the world of Breyer horses. The following video contains every photo I took (almost 100 photos!). I have the high quality photos still stored, and I will post any that are requested. What about you? Any that you are in love with? I was walking around the second level of the fair and I saw these dolls from afar. It was like they reached out and pulled me towards them. I had just left the Mattel booth, and (no offense, Mattel) but these dolls outshine every Barbie in that room. The Spin Master booth at Toy Fair was just awesome! Spin Master has some great things out right now! Their press release was also very useful in compiling this information. So far SpinMaster gets the best rating for working with the press! One of the most exciting things coming out of Spin Master was this Meccano robot. Meccano is a line similar to the Erector line (think Erector sets from the past). This was the demonstration of the MECCANO TECH – MECCANOID G15 KS robot. Meet the My Ballerina Dolls. These dolls are designed by an actual ballerina and are fully articulated so that they can strike the dramatic ballet poses. 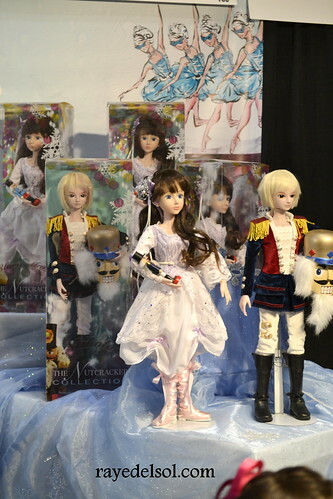 There are three dolls scheduled for the line-up: Dream Clara Marie, Nutcracker Prince, and Party Clara Marie. There is also a book scheduled to come out that retells the story just a little bit. The Nutcracker will take on a new identity to reflect the younger audience for these dolls.